In today’s world, accountants are needed by everybody; businessmen, self-employed professionals and even working individuals. Often, most of you face difficulties calculating your annual tax returns and end up making a haystack of your records. The thought of hiring an accountant must have crossed your mind, but disappointing services, and high charges would have refrained you from doing so. As a result of this confusion, you would have had to incur unpredictable losses. Our Contractor Accountants in Edgware have successfully managed to change this very idea, for we treat every individual’s need with equal importance. Several businessmen have gained from our excellent services and now the time has come for individuals also to leave their accounting blues with us. Inspecting and assuring that your tax compliances regarding your employees are duly complied with. All filings to the Companies House and HMRC are done timely and accurately. Keeping detailed and regularly updated records for your company as mandated. Providing excellent financial solutions for every situation. Attracting prospective investors for an integrated development of your company. Securing your sensitive data with Advanced Security Software and unique passcode protected accounts. These are just a few of the benefits that our clients enjoy through our premium quality services at most affordable prices. Assistance and guidance in filing self-assessment tax returns. Calculating your income tax accurately and ensuring maximum savings for you. Personalized services customized for your specific needs. Our expert services have made DNS Accountants a name to reckon with when it comes to choosing the correct accountancy house. We are expanding our services across the country and have now arrived in Edgware, for providing the citizens with access to premium services. An ancient parish in Middlesex, the district of North London, Edgware, enjoys a dual benefit of connectivity and the facilities of being identified in the London Plan as one of the major centers of trade and commerce in London. Primarily popular for its shopping center called the Broadwalk, Edgware attracts numerous visitors from all over London. This place is well connected to central London by all means of transport. Three tube stations are connecting this district to its nearby areas. Buses ply at regular intervals all day long. Also,it is notable for being the hometown of many famous personalities such as Eleanor Bron and Frank Williams. The area thrives with its commercial activities and has attracted a considerable population growth in the recent years. More and more business people are being attracted by the district’s unique rural-urban combination that serves as an ideal environment for establishing business houses. 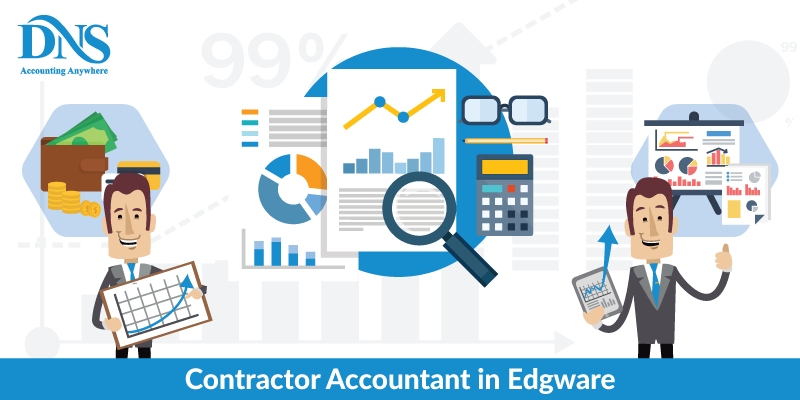 Due to such thriving business scene, there is an ever increasing demand for expert contractor accountants Edgware. Understanding this need, DNS Accountants are now offering services of some of the best chartered accountants Edgware. At DNS Accountants Bromley we specialize in small business, freelancer, and contractor accountant services. Our expert services have made us an award winning consultancy house, with more and more clients opting for us to manage their accounts. Our expert Contractor accountants Edgware have more than 10 years of experience coupled with highest qualifications. We have provided our clients with continuous professional guidance and support that has helped them excel despite serious competition. We also help our clients maintain accurate and updated financial records that help in assessing correct picture of their business and helps them with overall financial growth and increased revenue returns of the company. Keeping a record of the taxes is an important part of conducting business. To do this single-handedly is an almost impossible task for any businessman and involves the risk of miscalculations. Accurate tax calculation is a crucial aspect of business growth. But now you need not worry anymore. Leave this job on our professional tax consultants Edgware and be free to concentrate on your business without the blues of complex calculations. At DNS, our sole focus is on the quality of our service. Our highly qualified experts do all your financial year planning and year-end tax calculation, along with providing expert solutions on your problem areas. We are the ones propelling the growth of many successful business houses. Business people and residents of Edgware can heave a sigh of relief because we are finally here to deal with all your tax issues with expertise. Online Contractor Accountants Edgware - The biggest problem with the majority of consultancy houses it that they lack in providing online services. This is one of the major reasons why business people are skeptical about seeking the help of consultancies as offline accountancy facilities are fast becoming redundant. Also, the availability of online contractor accountants Edgware is scarce. At DNS, our tech-savvy professionals have made it possible for us to provide high-quality online accountancy services. Online accountancy has various benefits over traditional methods such as multiple deposits from any computer and at any time, payment of fees, permits, inspections through online mode. At DNS, our basic priority is customer security. We use a highly secured cloud based system to monitor and perform your business transactions. The service charges of contractor accountants can be quite high owing to the scarce availability, but at DNS we offer our services at highly affordable rates for everyone to enjoy the benefits. As Edgware is a developing district, there are plenty of small businessmen thriving here. DNS accountants are here to help such business people in managing their business. With our expert small business accountants Edgware, we have an intricate understanding of issues plaguing them. We also offer our services online to help you take care of every aspect of your developing business from wherever you want. The entire responsibility of checking financial data relies upon a chartered accountant. We have a team of expert qualified chartered accountants with years of business experience. Our accountants have intricate experience of internal accounting procedures. We also offer highly qualified general accounting services that include payroll services, bookkeeping, personal financial statement and allied services. So, the business people of Edgware, need not compromise with quality when DNS Accountants are here to offer you the best. Auto-enrolment affects every citizen of the UK and requires a continued ongoing coordination and administration to maintain your records correctly with The Pensions Regulators. Employers have to take additional responsibility to enroll each employee under this scheme. However, if the auto-enrolment panel is at full efficiency, this job becomes just a matter of seconds. DNS Accountants provide you with the best auto-enrolment services. At DNS, our sole aim is to enhance our client’s business development. We offer round the clock expert business consultancy services that help our customers in handling any issues affecting their business aptly and fasten their business growth. DNS Accountants helps the clients understand the fundamentals of accounting. Our popularity is a testament to the quality of our services with all our customers totally satisfied from our services. Our success has led us to expand our network to Harrow, Bushey, Pinner and Stanmore.